We are incredibly proud of our own brand "Alpentrachten"! Since 2013 Trachten fans can shop great and fair fashion - and not only for the Oktoberfest! The label Alpentrachten offers stylish and everyday dresses and costumes, which are full of chic and charm and an unbeatable price / performance ratio. 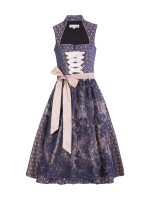 Only at Dirndl.com you can order the charming Alpentrachten-Dirndl online. Or you just get on your way and get your dream Dirndl directly from the warehouse sales in Lüneburg. Either way, you'll find the latest Alpentrachten collection with gorgeous Dirndl in trendy colors and cuts in the service-oriented Trachten outlet. In addition, you have the opportunity to get models from past years at discounted prices - although Dirndl of Alpentrachten are already particularly favourable! In general, the creations of the young label are characterized by a successful mixture of tradition and modernity. Classic cuts and traditional craftsmanship coupled with innovative fabrics and trendy colors are part of the alpine programme. For we know: Trachten are "in" again and appeal to many young people. That is why the label offers its Dirndl at affordable prices. One more beautiful than the other! The Alpentrachten-Dirndl convince by being fresh and modern, not a bit old-fashioned. It focuses on the coveted midi and mini sizes for hemlines. But also the original long style can be found in every collection. We find a suitable Dirdl for every body type, figure and taste! Generally, the Alpentrachten-Dirndl are delivered with the pictured apron, but without a Dirndl blouse. The selection of Dirndl blouses is so big that every Dirndl carrier would rather decide for herself, which neckline compliments her décolleté the most. Most Alpentrachten Dirndl wear the zipper in the center of the bodice, so you can wear and put on your Dirndl easily and completely independently. It blends wonderfully in the overall picture and can sometimes be concealed subtly by an elaborate bodice lacing, but also highlighted by eye-catching zipper platelets or ornamental decorations. Ordering Dirndl online - does it work? Of course! Our handy size chart will help you find the right Dirndl size for you. In addition, the designers of the Oktoberfest dresses attach great importance to a good fit. That is why all Dirndl tops of Alpentrachten have a generous seam allowance. So you have the opportunity to have your new favourite Dirdl customised by the tailor of your trust. The best option is to order several models for fitting because the return of the goods is free at Dirndl.com and you get your money back with 100% guarantee. If you are unsure about the range, if you have questions about the material or the delivery, then our telephone customer hotline would love to help you out. So start off from the comfort of your own home and look forward to the Oktoberfest season in the Dirndl shopping craze and secure your breathtaking Alpentrachten outfit!